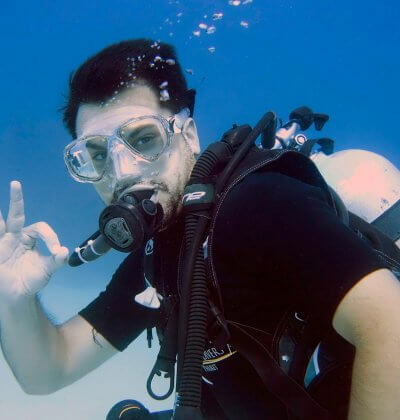 Do you love scuba diving? Want to share it with others on a whole new level? Take the PADI Divemaster course and do what you love to do as a career. Scuba divers look up to divemasters because they are leaders who mentor and motivate others. As a divemaster, you not only get to dive a lot, but also experience the joy of seeing others have as much fun diving as you do. 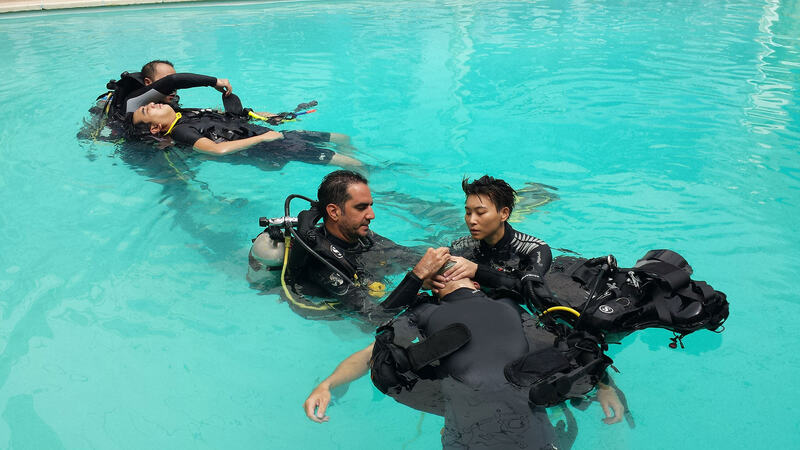 The PADI Divemaster course is the first professional level, and it is a very complete and rewarding course. 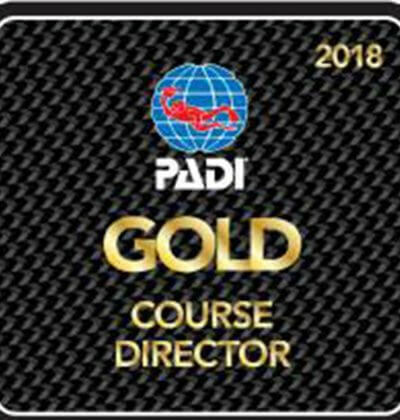 During this course you will work closely alongside the amazing Aussie Dives Instructional team, including PADI Course Directors, Staff Instructor’s and our highly experienced Senior Instructor’s (the best instructional team in Phuket!). “You will be part of our team”. Aussie Divers Phuket offers two different options to choose for your PADI Divemaster course, depending on your current experience level, number of logged dives, and how long you are planing to stay in Phuket for. 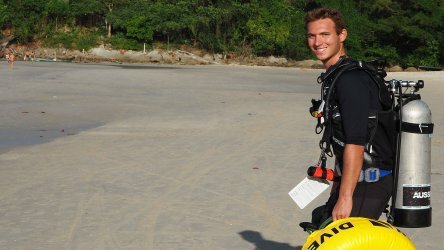 Most of our PADI Divemaster candidate’s in Phuket choose to do the more intensive ‘internship’ program over 2-3 weeks. 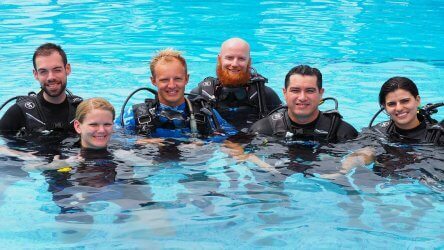 PADI Divemaster Internship style program, assisting with full PADI courses & logging more dive’s, from 2-4 weeks. 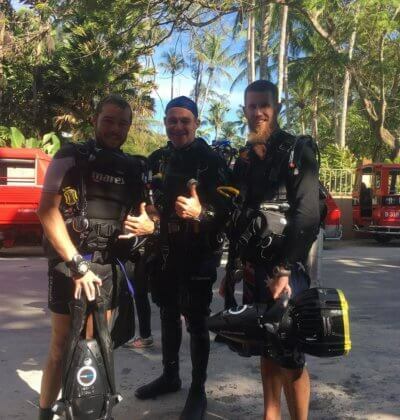 The Aussie Divers internship option is a unique ‘hands on’ experience where you will be assisting our instructor team with full course’s from start to finish. We will assign you one of our experienced instructors to act as your personal ‘mentor’ through out the whole divemaster program. This ‘mentor’ will assist you in developing your theory in the classroom and your skills in the pool, along with guiding you through the rest of the divemaster course. We also can offer great package’s with accommodation at our Chalong training centre included, please just ask our staff about what we can offer. For the Diving Standards and Dive Theory topics you will need your PADI Divemaster manual and complete the knowledge reviews related, afterwards you will have classroom lectures where each section will be gone through and your knowledge reviews will be checked. Aussie Divers is very flexible with the timing of the lectures and final examinations, we will fit them around your schedule, be it on the boat or at the swimming pool. Also, we are always available and happy to provide further explanations on any of the topics covered. With these 5 different workshops your will learn the programs that you will be able to conduct completely or partially when you are certified as a PADI Divemaster. You can also complete a short qualification and become a Discover Scuba Diving Leader which will allow you to independently conduct the PADI Discover Scuba Diving program. • The Encyclopedia of Recreational Diving – a comprehensive overview of diving physics, physiology, and equipment. Both programs included full equipment rental for the course, plus we can offer great packages with accommodation included at our Chalong training centre.